Washington Post just ran a piece entitled "White parents in North Carolina are using charter schools to secede from the education system," and it's exactly what we'd expect it to be. Saw the link to the article on Dr. James Avington Miller Jr.'s Facebook page. Miller, of The War Report on Public Education radio show fame, had the following salient comment posted with the link: "BACK TO THE FUTURE------BACK WHERE IT STARTED"
School Choice was coined by the segregationists, borrowed by the Broad/Gates/Walton Triumvirate, and now gleefully being reclaimed by the segregationists. Not just Southerners either, mind you. Check out Los Angeles "boutique charters" like Citizens of the World (CWC), Larchmont, and Metro. They cater to so-called liberal parents looking for "alternatives." What that really means is alternatives to having brown and poor children in their schools... well with the exception of those whose parents are self colonized and adept at respectability politics. Those are the parents of color that the Mike McGalliards of the charter project would boast are "so articulate" (read white-acting). 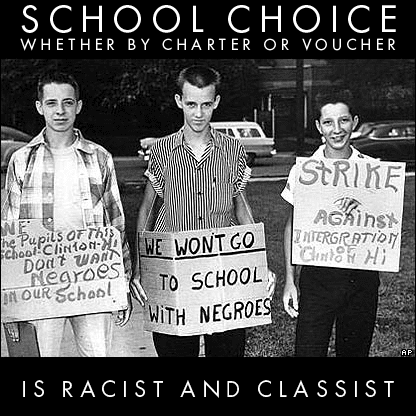 The concept of school choice is racist and classist at its very core.